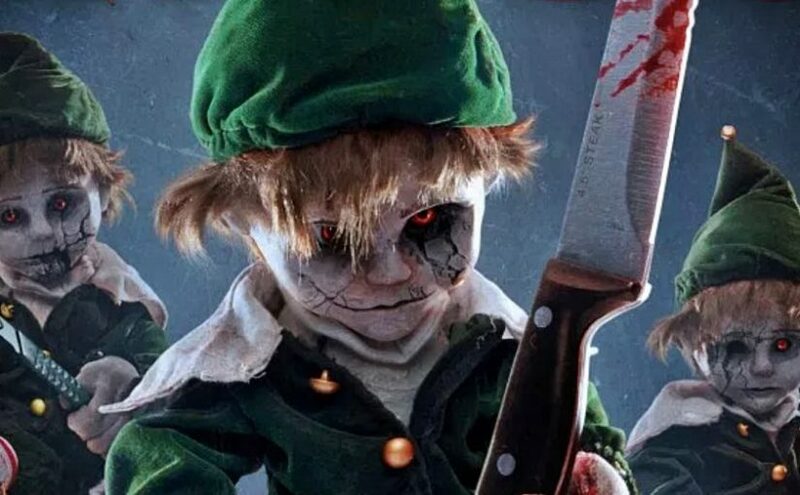 This holiday season, while everyone gets cozy around the fire and feels a calming cheer, horror fans can buddy up with Elves, a new sequel to The Elf. Taking in a holiday horror flick that puts the lives of multiple people on the naughty list into turmoil as they’re put into murderous challenges allowing them to survive. It all starts out well, you’re hanging out with friends, some well over the holiday spirit, a few shots go down and suddenly you’re tricked into signing up for a dark ritual for survival. Friends are dying off left and right and so are strangers in the town as possession, hallucinations, and more fill the air. Well, that might not be how it goes for everyone, but in Elves it sure is. The film uses creeper vibes throughout the runtime in visual and audio form to keep things just weird enough. The dolls themselves are a bit nightmare inducing, if you thought those cherub porcelain figures at the store were creepy, they’ve got nothing on these dolls. The story wastes no time getting into action, the group finds itself at odds to process the fate they’ve been dealt and the movie systematically runs through their challenges and actions. It’s brutal and blunt while also playing to the apparent fouls of their lives leading up to that point. When resistance is met the elf turns things up a notch to make sure they play along. As with many horror films of this genre, it’s not some unity moment where they all group together and overcomes the odds, there are some brutal handouts for everyone. Composition wise it’s a pretty consistent film, the contrast between the every day and the darker moments is clear, switching to high contrast or extreme darkness with murky ambiance. The cast does well with the work, showing signs of paranoia, fear, and apathy. You get a feel for the lone wolves that would rather let everyone else burn if it means they can get another day and how everyone seems to underestimate the power of a traumatizing elf doll. Elves is definitely something geared for the horror fans out there, and for those hoping to spring a fun twist to the holidays, it’s a good way to kill an evening with something out of the ordinary that still plays to the season. The story has fun twists and turns, there’s an air that everyone is genuinely doomed and I can’t say enough how utterly creepy that elf doll is and how it’ll haunt me for a few weeks at least. Running a movie based on an inanimate object isn’t easy and it’s done in this case with enough mysticism and visual play that it slips in there without being weird.